From 2012 onward, countless hours of attention have been paid to James Cameron’s dive into Challenger Deep—the deepest point of the Mariana’s Trench (which resulted Rolex producing a watch in his name). His feature documentary on the experience hit theaters in 2014, and since then countless hours of attention have been paid to this groundbreaking modern expedition. What may come as a surprise to many is that Cameron’s dive was not the first of its kind, and its predecessor dates quite a bit further back than you might expect. 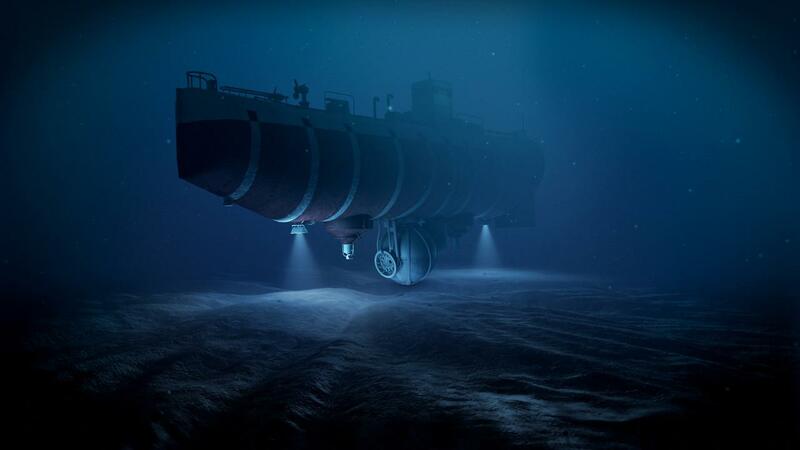 Here is the Bathyscaphe Trieste underwater. 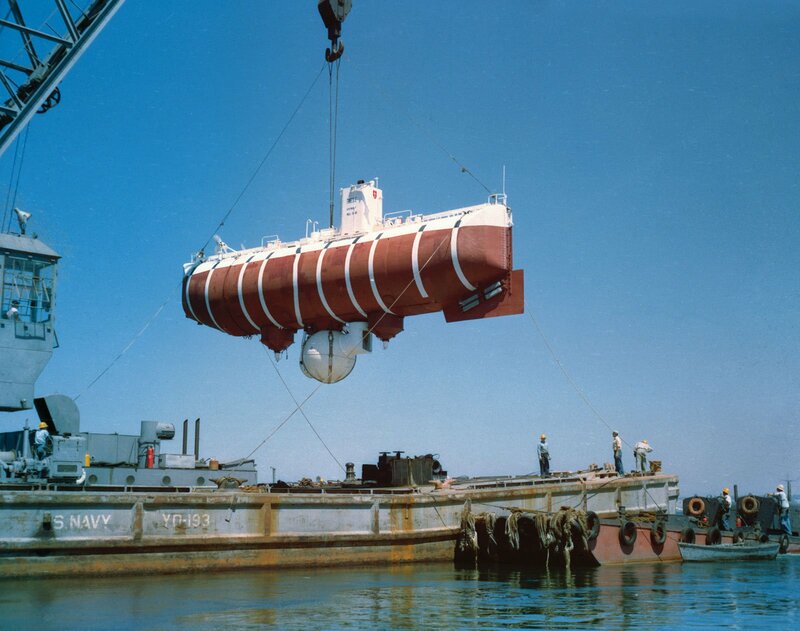 In January of 1960, US Navy vessels began towing the Bathyscaphe Trieste—an Italian-built deep-diving vessel measuring over 50 feet long—to Mariana’s Trench as part of Project Nekton, a series of manned dives planned to explore the depths of the trench. Manning the craft were Jacques Piccard, son of the Trieste’s designer Auguste Piccard, and U.S. Navy Lieutenant Don Walsh. By this point the Trieste had over 64 successful dives under its belt. However, none could prepare the vessel (or its chief engineer Giuseppe Buono) for this experience of reaching the deepest place on earth. A testimony to the astounding ability of the watches produced by Rolex, as they sent a specific watch down with the vehicle. 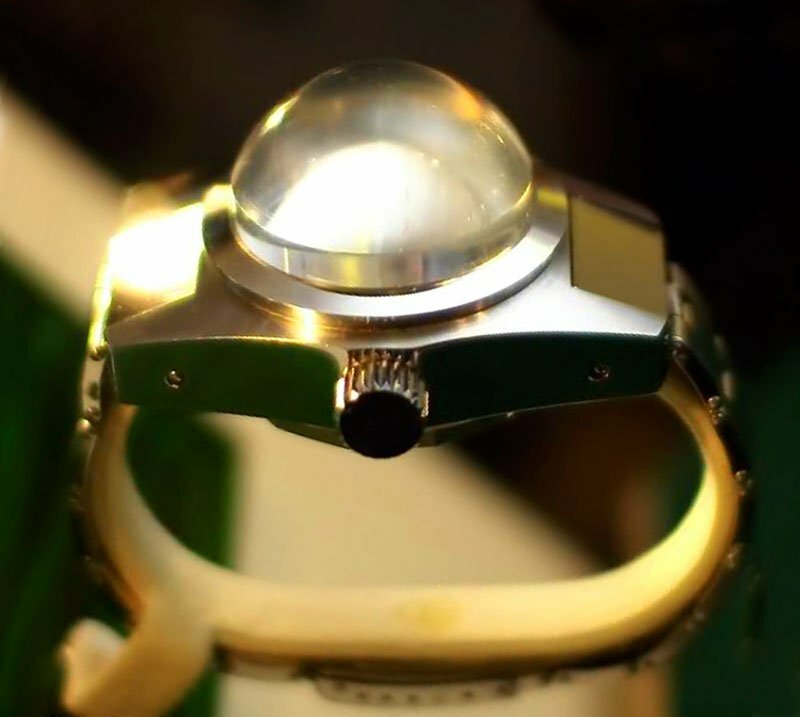 This watch was tied on to the outside of the submersible. The Trieste was the second bathyscaphe designed by Auguste Piccard, the first of which he sold to the French navy in the early ‘50s to fund the launch of the Trieste. Come 1958, Piccard found himself at a deficit once again, and was provided the opportunity to sell the Trieste to the US Navy for a sum of $250,000. That same year, Project Nekton was proposed to the U.S. Navy by oceanographer Dr. Robert S. Dietz, and it wasn’t long before modifications began on the Trieste to further bolster its capability to survive the pressures of such an immense undertaking. Once on site in Guam, it became clear that the currents across the Pacific had left the Trieste in less than optimal condition. The bathyscaphe’s surface telephone—required to provide final pre-dive instructions—had been torn away during its ocean crossing, and its tachometer—required for monitoring rate of descent and ascent—had also been destroyed along the way. The crossing’s final victim was the vertical current meter, still attached, though hanging on for dear life. Faced with the prospect of months of delay for proper repair, chief engineer Buono proceeded to make final checks on more make-or-break equipment throughout the vessel, and with only a hint of reservation, he made the call that the Trieste remained dive-worthy enough that the team should proceed as planned. The Bathyscaphe Trieste had a handful of risks, but men braved the mission and completed their objective. Given the level of technology available at the time, identifying a secure drop point took a fairly crude approach by today’s standards. Depth sounders at the time had no ability to reach their 35,000+ foot target, so blocks of TNT became the method of choice. Blocks with long fuses lit would be dropped over the edge, and it was the recorded measurement of time between detonation and the return of blast waves off the sea floor that became the team’s gauge of where the deepest point could be. After much patience and a couple days of blasting, the site was secured and ready for one of the biggest underwater adventures ever seen. The morning of January 23rd, Walsh and Piccard boarded the Trieste intent on reaching the bottom of Challenger Deep. Anticipating a return journey of roughly nine hours, the men huddled into the compact bubble at the bottom of the vessel, and began their descent. Within a mere 1,500 feet, the duo was faced with total darkness, reading their instruments via a small light in their viewing cabin. At roughly 5,600 feet and again when crossing the 10,000 foot mark, surface contact was made to ensure that operations were still smooth both above and below water, and from there the vessel continues on its path, dropping ballasts to slow its decent as the Trieste gets closer and closer to the ocean’s floor. All of these events led to the James Cameron dive which was commemorated with this watch. It was somewhere beyond the 30,000 foot mark where Walsh and Piccard first felt a true sense of unease. 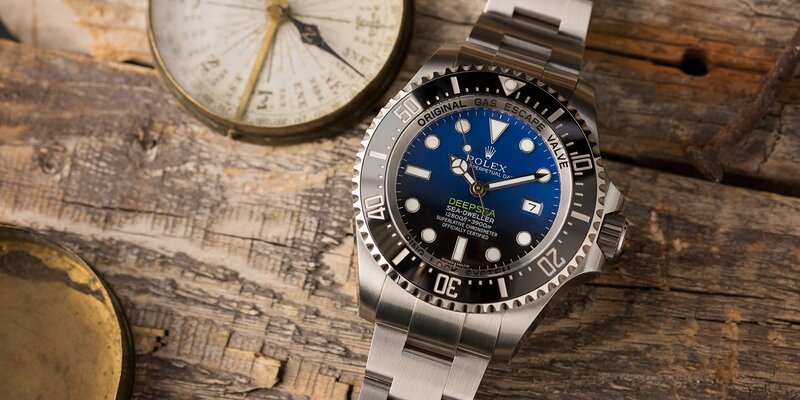 More than double of the Rolex Sea-Dweller 116660. With the vessel currently experiencing external pressures in excess of 150,000 pounds per square inch, a loud bang echoed through the cabin. After a momentary pause, the pair thoroughly examined all of their gauges, found no fault or concern, and opted to press on. Reflecting back on the moment decades later, Walsh remembers thinking that if something catastrophic was going to happen it would be instantaneous, and because this wasn’t the case the assumption was made that they were safe to press on. Finally touching down on the sea floor, further from the surface of dry earth than any that came before, the arrival was treated in a very matter-of-fact fashion. The duo shook hands, stared out the porthole for 15-20 minutes hoping the silt on the would settle, and then dropped ballast in order to begin their long journey back to fresh air. Though they spent some time pondering who would be the next to reach this previously uncharted world. Little did they know it would take 52 years, and the ambition of a legendary director and film producer to relive and retell their epic journey for a new generation.